High Income Malaysia or A Developed Nation? I must admit that I am impressed by the Prime Minister’s confidence in saying that we will become a high-income nation by 2018- two years earlier than the original of Wawasan 2020. The rest of the cabinet members, (with the likes of Senator Idris Jala, DS Wahid Omar and DS Ahmad Husni) also echoed the same view. What is meant by the Wawasan 2020? If you ask any students from my generation, most likely you will see a painting where there were flying cars, skyscrapers and high-speed trains everywhere. But if you ask PEMANDU, they will paint for you a nation with the per capita income of USD45,000, RM1.5 trillion in gross national income and a high-income economy. When Wawasan 2020 is achievable? If you ask the architect behind it, Tun Dr Mahathir Mohamad – he will not hesitate to say that we may not achieve a developed status by 2020. That, of course, is a stark contrast from what has been assured to us by the PM, PEMANDU and cabinet members who keep telling us we can achieve that status earlier than expected. What causes for the difference? The answer is that, the first is all about progress in science,knowledge and technology while the latter focused on the quest of high income alone. To put it simple, it is a question between the developed country’s status and a high income economy. Qatar has the highest per capita incomes in the world with an average of its citizen earn RM330,000 per year. Brunei citizen is currently accumulating a whopping RM160, 000 a year thus making them the fifth richest citizen in the world. Little that we know that both of these countries are richer than Germany, the United States, Japan, Norway and many of the developed countries. Does it mean that the two countries are more advanced and developed than these countries? Certainly not. But they are the high income countries. Therefore, it should be noted that while developed countries enjoyed a high income salary for their citizen, the high income country is not necessarily a developed country. One question- is Malaysia headed towards being a developed nation or a high-income country? At the moment, the government is very clear about the ‘middle-income trap’ in our economy. To overcome this situation, the government had spent RM7.2 billion on consultants. The result? All kinds of programs with various acronyms such as ETP, GTP, MKRA, NKRA, NKEA were created. We were repeatedly told, since 2009, our per capita income has increased by 42%. On average, Malaysians have become richer by RM3,000 for the past four years. A total of 196 projects under NKEA will contribute as much as RM144 billion to the country by 2020. Considering this development, does this mean that Malaysia is a rich country and a high income economy? The answer is obviously yes. Does this also mean that our economy has shifted from labour intensive industries to an economy based on high technologies and high-skilled workers? Not really. Does this mean that Malaysia is a developed country? Well, not. The truth is, we still ‘addicted’ to cheap labours, especially foreign labours. One of the largest textile company in Malaysia employs hundreds of foreign workers to work in here so that the production cost can go down. This practice, of course, has resulted numerous products to be sold at cheaper prices in their stores nationwide. Unfortunately, the same business model is also being used by the thousands of small and medium enterprises (SMEs) in Malaysia. No wonder Malaysian workers are screwed in terms of wages because one third of the total workforce (read: foreign labours) are willing to settle at lower wages. In addition to that, Malaysia is still too dependent on real estate development and infrastructure project in stimulating the economy. To prove this point, how many mega projects with the size of KLCC have been launched in Kuala Lumpur lately? Easily five to ten projects. Each of multi-purpose developments has thousands of residential units, office spaces and hundreds of thousands of square feet of shopping complex. Who will occupy these spaces remain a mystery. That, of course is another question. Undeniably these projects have created jobs, contracts to suppliers of materials, contractors, and consequently contribute to the government’s coffer through taxes. But what is the high-technology or innovation that can be derived from these projects? Hardly none. One thing for sure, many companies (namely property developers and banks) are getting richer without the government has to be creative in developing the economy. The fact that the 10 richest people in Malaysia are 12% richer than the 10 richest people in Singapore showed that it is not that difficult to make Malaysia a high income nation. Just create two or three ‘billionaires’ and accumulate their wealth together with the rest of the workers and divide it equally. The net income will give us a high per capita income. This explains why countries like Qatar, Brunei, Kuwait and Bahrain are regarded as high-income countries. It is only because of the oil. The truth is, they are hardly developed in terms of science, skilled workers, knowledge and technology. Admittedly the government may feel the pressure to achieve the developed status in less than six years. Considering the economic downturn in 2008 coupled with political instability for the past two elections, the pressure is even more. But that doesn’t mean we can take the easy way out by solely focusing on a skewed high per capita income basis. If we insist on doing thing such way, we can be a high income country by 2018- as correctly said by our Prime Minister. But is this what we aspire to be? 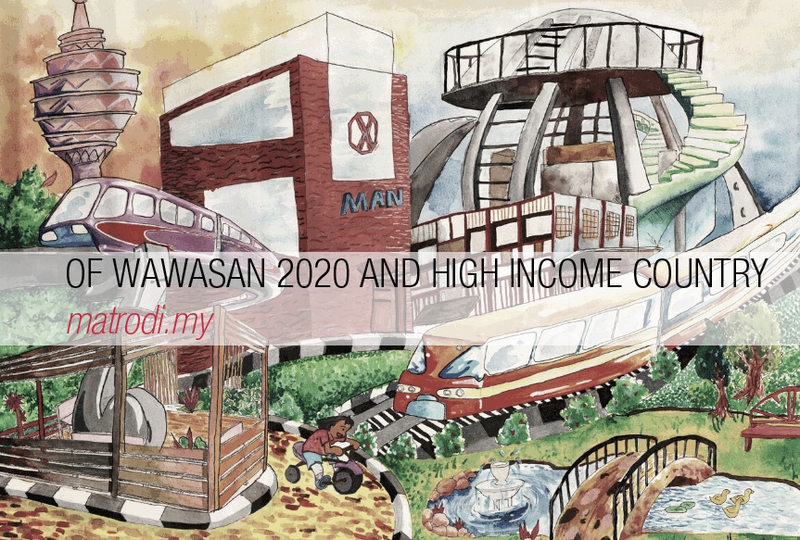 Is this what has been drawn in ‘Malaysia 2020’ painting? Without an economy based on high technology and knowledge, we cannot claim that we have developed. How could we say the Wawasan 2020 has been achieved when none of our products is needed by one-fifth of the world’s population like Samsung? Apart from Petronas and AirAsia, how many of our companies or brand that truly a world class player? We have been trying to achieve that by creating Proton. Unfortunately, many do not see the national car project is an effort to make Malaysia a developed nation. Even worse, they belittle and ridicule the product as if we are already the Koreans or Germans. We also do not have an IT company where the annual income is 10 times more than our country’s largest company, Petronas. We are still far behind in creative industry where we can produce a film that easily could be watched by 300 million people like the Transformers series or the Star Wars trilogy. Even though we have skillfull people and endowed with natural resources, we failed to create a furniture company that based in 43 countries just like IKEA. Pointing this facts should make us realize that the journey to become a developed nation may take longer than expected. Malaysia is at the crossroads. Do we want to become a developed nation or a high income country quickly? How is that China can create a company like Alibaba? Aren’t the Chinese (at least of the PRC variety) supposed to unimaginative apparatchiks? Yet here is China with aspirations to be a superpower without achieving “developed” or “high income” status! Actually they created 2 , alibaba and baidu. Both were reversed engineered (SOME MIGHT EVEN SAY COPIED) from us creations … amazon and google respectively. The founders studied in the usa and worked there in these industries. Returned home to china and started the chinese clones of these successful us business models. Thank you En Mat for a very insightful article. Corbulo and Adam Smith, Alibaba and Baidu were successful because of the huge population of Chinese (rakyat China) and the Chinese Government reluctant to open up their internet a few years ago. So the void (due to the absence of the Western’s search engines, eCommerce companies and etc) provides an excellent opportunity for the Chinese indigenous co.
We do not have that ingredient in Malaysia. A big irony about aspiring becoming a “developed nation” is that we may work so hard to achieve it but we can also easily lose that status not long after having achieved it – for the simple reason that the world around us also keeps moving and new goalposts will be set up whereby new nations will overtake us as “developed” while we may get left behind again if we decide to remain static after a while. Look at ancient “civilisations” such as Rome, Greek, China and Egypt which, during their peak, would have qualified as “developed nation” in that ancient era and then they declined and for the past hundred odd years new modern nations such as the UK, USA and Soviet took over as benchmark of “developed nations”. Aren’t we just getting onto a rat race which leads to no where, really? I guess from this angle it is easier to be “high income” and enjoy it while it last; at least even if we don’t get onto that rat race some of us (especially the gomen) can still enjoy some wealth and bragging rights – however hollow it may be.